Mid rise; wide elasticized waist. Nylon waist panel and lining. Eileen Fisher stretchy knit pants. Approx. measurements: 11" front rise, 25.5" inseam, 5.5" leg opening. Dropped, slash pockets. Slouchy silhouette. Eileen Fisher stretchy knit pants. Approx. measurements: 11" front rise, 25.5" inseam, 5.5" leg opening. Dropped, slash pockets. Slouchy silhouette. Tapers at ankle. Viscose/Lycra® spandex. Hem, recycled polyester/Lycra® spandex. Machine wash recommended. Made in USA. Model's measurements: Height 5'10.5"/179cm, bust 32"/82cm, waist 23.5"/60cm, hips 34.5"/88cm, dress size US 2. 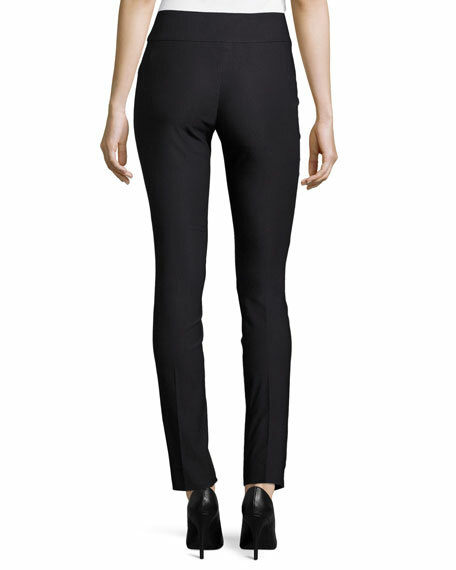 Eileen Fisher pants in signature washable stretch crepe, available in your choice of color. Approx. 27.5" inseam. Welt seam contours center front and back of legs. Elasticized pull-on waist. Smooth through the hips. Slim, straight legs; ankle vents. Viscose/nylon/spandex; machine wash. Made in USA of domestic material. Eileen Fisher stretch-crepe pants. Wide, smooth waistband. Slim, boot-cut legs. Pull-on style. Cropped at ankle. Slit cuffs. Viscose/nylon/spandex. Machine wash.
Eileen Fisher stretch-crepe pants. Wide, smooth waistband. Slim, boot-cut legs. Pull-on style. Cropped at ankle. Slit cuffs. Viscose/nylon/spandex. Machine wash. Made in USA. Model's measurements: Height 5'10"/177cm, bust 33"/84cm, waist 25.6"/65.2cm, hips 35.8"/91cm, dress size US 2-4/FR 34-36.